The process is a grueling one. First you have to search for the perfect home. Then you have pass a credit check. Then you have to meet the approval of the landlord’s potential strict reviewal. This becomes doubly harder when you a first-time renter. But there’s one real estate tech group that make this all the much easier — or at least bearable. 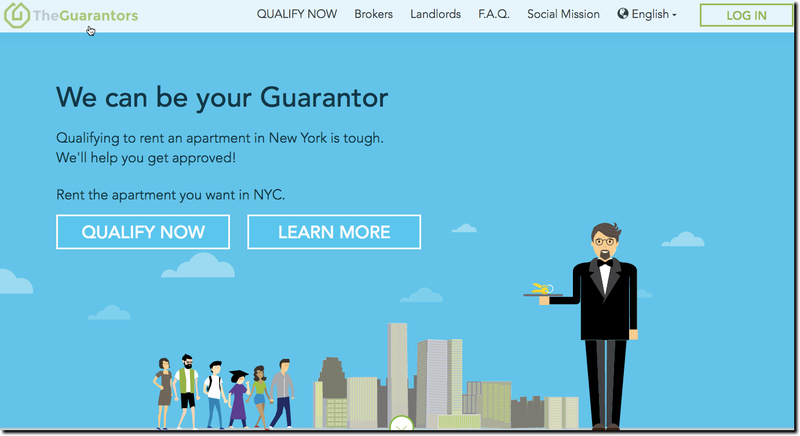 The Guarantors, a local startup, acts a personal cosigner when you fall short in the rental process. The platform was clearly designed to cater to college students, international workers and anyone that has had trouble getting into their dream pad. After the approval is given, the Guarantors issue a Surety Bond to the landlord that is backed by The Hanover Insurance Group. That means that in the worst case scenario that the tenants stop paying rent then the landlords can receive its full payment through a certified insurance company — as well as fees and other extraneous holdovers. The biggest plus for the prospective renter with using the tech company is that the startup is responsible for the entire rental process. Even cooler, the company’s algorithms "can successfully assess the quality of an applicant and their potential to make on time payments,” techcrunch.com reported. So far, the young business has worked with major landlords such as the Gotham Organization and Peter Cooper Village/Stuyvesant Town. The service doesn’t cost the landlord dime — in fact, the landlords have preferred this process since the inclusion of the Surety Bond. But the renter will pay upwards of 5-10 percent of the annual rent as a fee to the Guarantors. The cost comes out to be a little less than a brokers fee. Still, the fees are worth the time since you are nearly guaranteed your preferred apartment and many landlords won’t require you to use the online service for a lease renewal. Also, you avoid any added large security deposit or months with this route.